Viking Yacht Company's renowned reputation for building incomparable Sport Fishing yachts continues to stand firmly at the top as they present the impeccably designed 72 Convertible. The new 72 Convertible is the fishing machine you have come to expect from Viking Yachts while also providing your guests on board with unmatched, unforgettable luxury. The standard Open Bridge Accommodations Layout includes four Staterooms, each with a private Head, a J-shaped sofa in the Salon, a U-shaped Galley with custom granite counter tops, crown molding on upper cabinetry, a large walk-in Pantry forward, and a queen berth in the Forward Stateroom. An optional layout also offers crossover berths in the Forward Stateroom. The standard Enclosed Bridge Salon mirrors the Open Bridge plan with the addition of a circular staircase to the Enclosed Bridge Helm, which serves as a second Salon with an L-shaped sofa, a cocktail table, refrigeration, and an entertainment center. An open Galley, an L-shaped sofa and crossover berths in the Forward Stateroom layout also are available. The Day Head is standard on both versions. CALL TODAY TO ORDER YOURS TODAY!!! 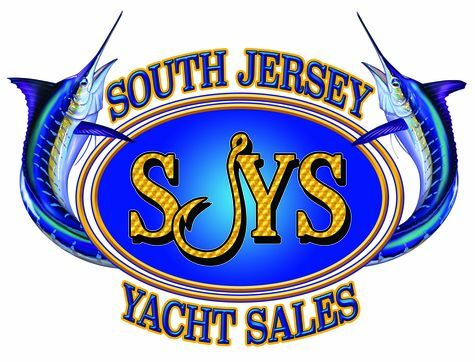 South Jersey Yacht Sales at Arnold's Yacht Basin, 1668 Beaver Dam Road, Pt. Pleasant, NJ 08742 (732) 899-9666. Ablative / Copolymer anti-fouling bottom paint (2 coats), using "Interlux Interprotected epoxy primer system"
Home theater center w/ 55" HD TV on a raise & lower mechanism w/ antenna or cable hook-up & Bose system w/ surround sound. TV is fixed mounted. Electronic trolling valve controls - *MAN & MTU utilize ZF Autotroll; CAT utilizes "CAT Advance Trolling System"
CAT C32A 1925: 1925 mhp. MTU 12v2000 M96L: 1945 mhp. MTU 16V2000 M96L: 2635 mhp. Viking’s legendary reputation for building peerless Sport Fishing yachts continues to wave its reign as we introduce the impeccable 72 Convertible.